Now, while it’s great to buy products that help us look our best, there are times when you just need a little expert help. That’s why we entrust a beautician for bridal makeup, a threading expert for eyebrows and a hairdresser for, well, our hair. That’s why for Desi Girl’s Blog, I’ll be looking at a range of services out there, from the weird, wonderful, to downright unnerving, to suss out the best treatments out there for you. So firstly, let’s talk feet. While we’re busy focussing on beautifying our faces and perfecting our hair, our feet are more than a little neglected. I’m no exception – I slather on the hand cream, but I generally ignore my feet as they spend 85% of the year snuggled in socks. And, to be honest, I’ve been lucky enough never to suffer from dry skin or cracked heels. However, a recent trip to Istanbul made me stop and think. Days of walking across dusty hills in flip flops meant that my feet had seen better days, and I had to put an end to my happy-go-lucky, footloose attitude. I tried a DIY job when I arrived back in the UK – i.e. soaking my feet in hot water and sloughing. However, I felt I needed to enlist some expert help to get them fit for flip flops again. That’s when I visited Urban Retreat, an upmarket day spa nestled in Harvey Nichols in Manchester. I opted for the Pristine Pedicure, a 45-minute treatment which cost £39. Being a pedicure novice, I wasn’t too sure what to expect, and was a little put off when I saw that people were getting their nails done in an open plan nail bar in full view of the shop floor. However, I was relieved to find that I was taken to the back of the spa to have my pedicure, out of full view. I was seated on a custom made chair which not only had a water-filled basin at the end, but also rolling, heating and massaging functions at the back, which I discovered about five minutes before my treatment was finished. Oh well. Anyway, the nail technician, Kelsy, got to work with the cuticle pusher and oils while telling me about the nail gels on offer, which are a harder, longer lasting, chip-free alternative to traditional nail polish. Kelsy also got sloughing with the exfoliating scrub, during which I had to fight back giggles. Yes very immature, but when you’re feet are tickled you’d do the same. The treatment was finished with a soothing massage, which I have to admit was slightly uncomfortable, mainly because the balls in my feet had probably never been kneaded before. Nonetheless, the massage did seem to loosen calf muscles which had probably been knotted forever. The treatment was finished with a french polish, followed by me spending about 15 minutes walking around with stick-on flip flops while the polish dried. To while away the time, I took a moment to have a complementary skin scanner. The scanner mapped out my face and highlighted problem areas such as pigmentation, blemishes and lines. This was a frightening revelation, but in hindsight, I don’t think many girls would escape the skin scanner with a glowing image. The scanner was designed to shock. And it did so to such an extent that I spent a small fortune on Dr Murad’s skincare. Yes, I know, I may be gullible but if you saw what I did that day, you’d want to take action. I’ll be sharing the results of my splurge, good or otherwise. Anyway, back to the pedicure. Kelsy did a lovely job with the painting, but because it was raining, I had to wear court shoes, which managed to swipe the colour off both big toes. I did a half-baked job of repainting myself, which made me realise exactly why people are employed as nail technician, as the amateur job stuck out like a sore thumb. Overall, while the pedicure was a nice experience, I wish there was a little more emphasis on exfoliating, as this was my main bugbear – the focus was mainly on the nails themselves. However, I would recommend the pedicure as a treat for yourself or someone else with tired out feet, in fact it’s the perfect treat as a spa gift. 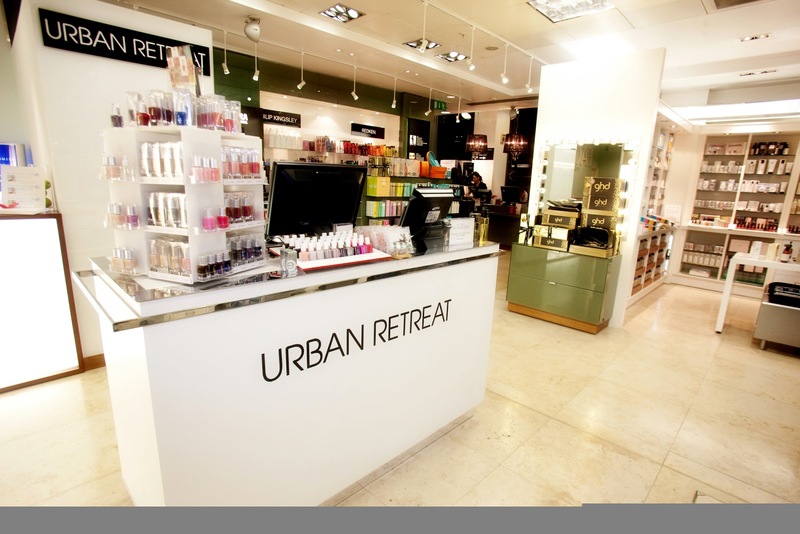 Urban Retreat has boutiques in Harvey Nichols, Manchester, and Harrods, Knightsbridge.